Connect up to 9 PWM fans to your mainboard's CPU socket. 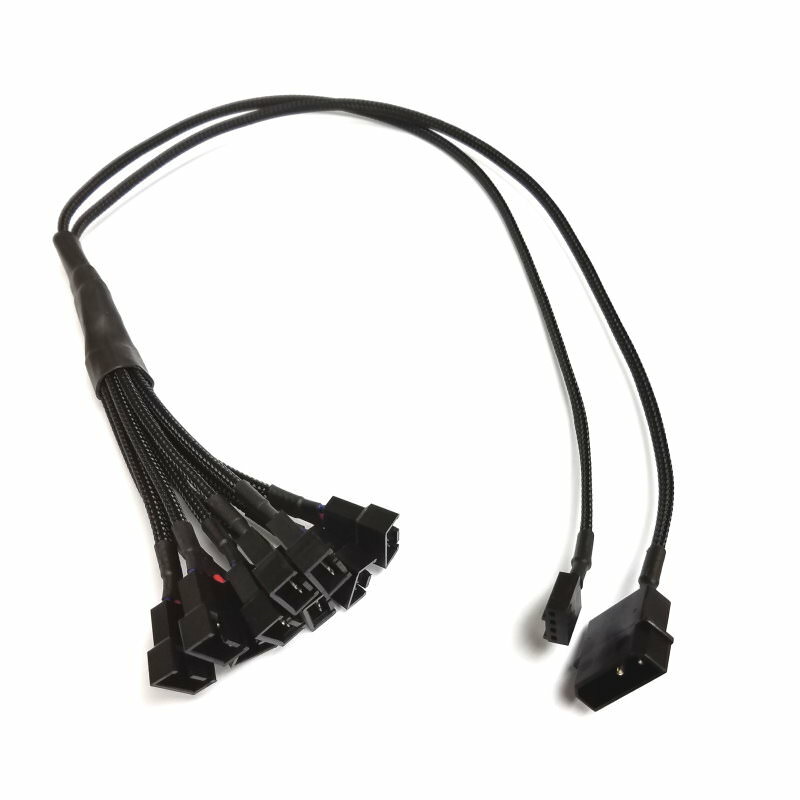 Use the PWM 1-to-9 Cable Splitter to connect a series of up to 12 PWM fans with direct power supply from PSU in one go. This splitter alouds the PWM signal input from the mainboard to control up to max. 9 PWM fans. Connect 9 PWM fans to your mainboard’s CPU socket with direct power supply from PSU. Use multiple PWM splitter to connect 9 PWM fans and provide additional cooling as before. Power drawn into your CPU cooler is adjusted depending on its temperature. An idle CPU does not generate as much heat, requires less active cooling, and hence slower fan speeds will be sufficient. Further this also reduces the overall ambient noise of your PC and it's handled automatically with little risk to your PC components. While PWM fan controllers are very common in today’s PC industry and available on most mainboards, there is often only one or two such PWM headers, reserved for the CPU and or the chipset fans. One way this excellent noise reduction idea can be extended to the numerous case fans inside a typical PC is by utilizing a PWM splitter. The splitter provides a length of 50cm. 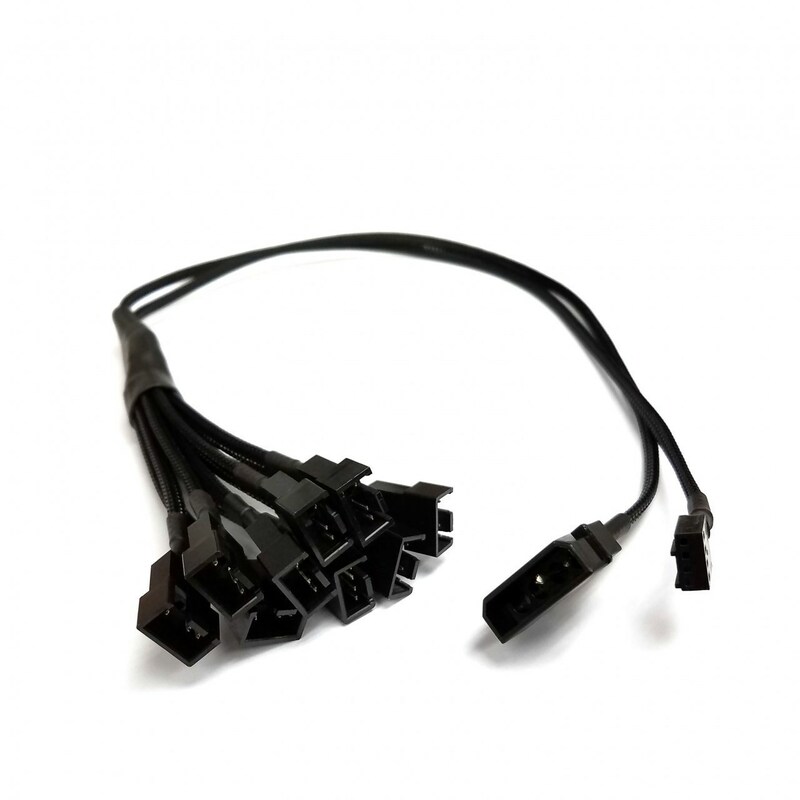 Click the button below to add the Computer Fan 4-Pin PWM 1-To-9 Fan Cable Splitter Sleeved Cable (50cm) to your wish list.